For too many people, gratitude exists primarily as a feeling about people and situations. Yes, to feel grateful contributes a sense of happiness and enhanced health. Is that why gratitude is important? The salutary effects are a by-product, not the reason that we should feel grateful. Feeling grateful, just like any feeling, can be misunderstood and misleading. There are all kinds of ways to manipulate our feelings as a way to avoid dealing with some other darker reality. Feeling grateful is not enough for our lives to be filled with happiness and health. I am convinced that we must act in a grateful way, and not in some off-hand, random way, but with clear intention and purpose. To act grateful, as I wrote a few weeks ago in a column, “affirms and validates the importance of our connections to one another.” Just feeling that connection is inadequate. That other person may never know of our feelings of gratitude. We must act on those feelings by making the connection between us matter. This is the purpose of the Circle of Thanks guide that I create to identify whom I need to consciously, intentionally, actively thank. A feeling of gratitude can be here one moment and then gone on the wisp of another feeling or distraction. An act of gratitude changes the relationship, and in an organizational context is a subversive act against those structures that inhibit the exchange of genuine human emotion and the interactions that create a stronger, healthier social bond within the organization.. In the scheme of The Five Actions of Gratitude, the second action is to Give Back, which is similar to the idea of Paying It Forward. The difference is that we make the connection with those whom have made a difference in in our life and work. I came to understand this as an act of gratitude because of a local group, Lessons in Leadership, that I am a part of here in Asheville, N.C. We are an all volunteer, charitable, leadership motivation and training event group that came into being as a way “to give back” to our community. We host a Main Event every January. Our next event is January 26 at Lipinsky Auditorium at UNC-Asheville. You are welcome to attend. We also conduct leadership workshops, using local talent. Our events are offered at a low cost so that businesses and organizations in our community, who would not ordinarily have the resources to pay to attend a world class leadership event, can bring their teams. All the money we raise goes to local charities. Our joint experience of giving back over the years has strengthen our friendship and shown each of us in very tangible ways the importance of saying thanks and giving back can be for our lives and work. Our friendship transcends most of our business relationships because gratitude is at the heart of what we seek to do. There are two steps to giving back. The first is to express your gratitude to the person or group to whom you have feelings of gratefulness. Using the Circle of Thanks guide is a way to identify who these people may be. The second step is to find some way to honor the gift for which you are grateful by giving back in service. For many non-profit organizations, their most passionate, loyal volunteers were at one time recipients of their services. Now, they join the organization as a way of giving back in thanks by helping others. I know people who are dedicated to donating blood because of the units of blood a loved one received during a serious illness. Many people serve on non-profit boards because of the service the organization has provided them in the past. Many philanthropic gifts are built around the connection that we have with one another. “I’ll support your cause if you support mine.” Behind this expression of friendship are feelings of respect, mutual contribution and gratitude. I’m sure that there is a short list of people for whom you’d drop whatever you are doing to respond to a request or need that they may have. This exchange of gratitude expressed in service is a tangible demonstration of the importance that kindness and caring have in our relationships. These are expressions of human relationship that make it possible for great endeavors to succeed. Without there being a connection that is based in giving and service, the relationship lacks depth and the kind of impact that is possible. When our expression of thanks is combined with service, the Give Back Two Step, we begin to see new avenues for our relationships to make a difference. 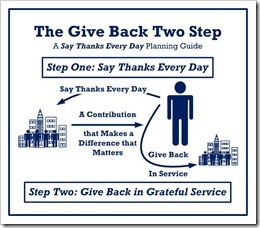 Just like last week’s Say Thanks planning guide, I’ve created one for Giving Back. 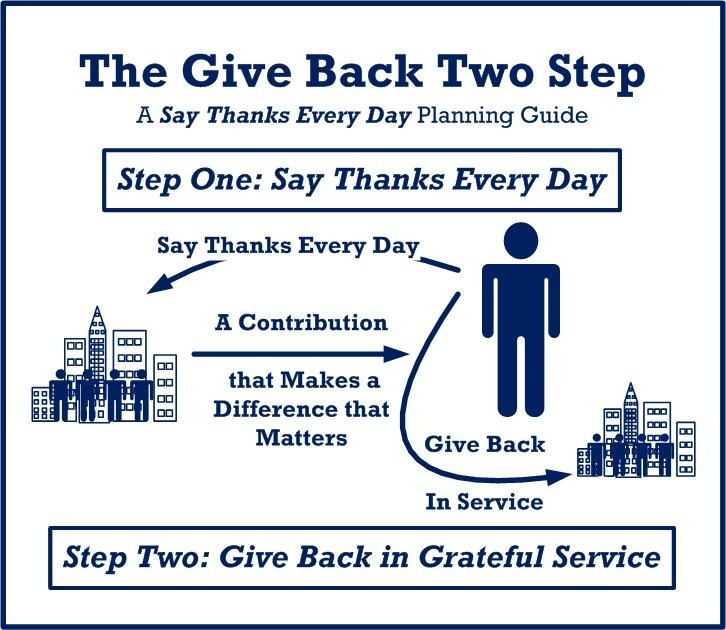 The Guide illustrates the two steps that we can take, to say thanks and to give back. As you reflected last week upon whom to thank, you developed a list. So, the first step is done. On this guide, I’m asking the following question to focus our efforts at expressing gratitude. Who, in my Life & Work, has made a Difference that Matters? The second question helps us to focus on how we can respond in service. What Opportunities Do I Have to Give Back In Grateful Service? The value of this action step may not seem evident at the beginning. However, if over the course of a few months or a year, you find that you respond to people by giving yourself in service to others, I believe you’ll find that your experience of begin grateful is far more whole and complete than it would be if all it meant was feeling grateful about various aspects of your life. The principle at work here is that in all healthy relationships there is a practice of mutuality that is the source of the meaning in our friendships and best work relationships. So, give it a try. Go do something as an intentional act of gratitude for someone. It will make a difference that matters for those you thank and serve, as well as for yourself. Next week, we’ll look at the practice of hospitality as a action of gratitude. Thanks very much. Tagged with action, authentic happiness, circle of thanks, feelings, Five Actions, gratefulness, gratitude, happiness, health, impact, Lessons In Leadership, pay it forward, Thanksgiving.